Get some cultural insight at Itchan Kala and Friday Mosque. Popular historic sites such as Citadel Kunya-ark and Mohammed Amin Madrassah are in your itinerary. Take a break from Khiva with a short trip to Urgench Youth Lake Complex in Urgench, about 46 minutes away. There's much more to do: step into the grandiose world of Stone Palace (Tash Khauli), steep yourself in history at Kalta Minor Minaret, see the interesting displays at Shirgazi Khan Madrasah, and admire the striking features of Alla Kuki Khan Madrasah. 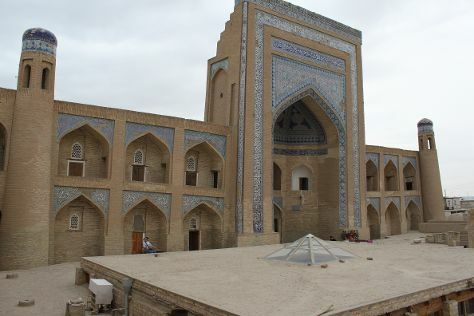 Quickly create a custom-made itinerary for Khiva using our trip planner. If you are flying in from Australia, the closest major airport is Urgench Airport. In May, plan for daily highs up to 35°C, and evening lows to 18°C. Finish your sightseeing early on the 4th (Sat) to allow enough time to travel back home.